It may be early in the season but the class of rookies are already showing their worth. Between the SuperDraft picks and the academy kids that will likely be considered rookies this season, the race for Rookie of the Year will be a hot one. For me right now, one kid is standing firm as the leader in the clubhouse after seven weeks. Houston forward Will Bruin not only scored a hat trick last week against D.C. United, he also jumped to the top of my list for good as the top rookie so far this season. Yeah I know it is early and nearly the same time last year we had a rookie (New England’s Zach Schilawski) do the same thing. But Bruin looks to be a kid that will stay on top. 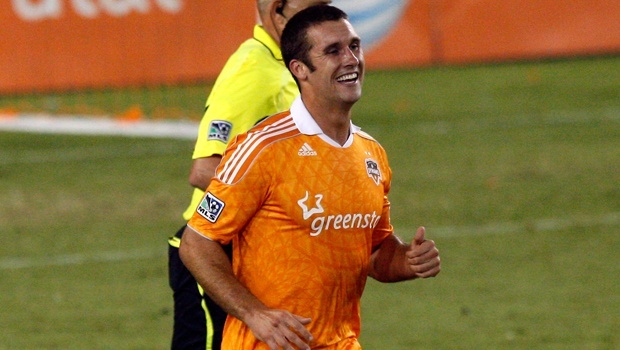 He’s holding down a starting spot and is helping the Dynamo on their six-game unbeaten run. Impressive stuff from the rookie. Oddly enough he’s also tied for second in the league right now in scoring (doing a hat trick usually helps you move up the Golden Boot standings quickly). After Bruin I have a short list of guys that are currently in the rookie race (no particular order here). Omar Salgado (Vancouver Whitecaps) – The top pick is slowly inching his way up my rookie board here. He scored a goal against the Columbus Crew this past weekend as he found his way into the starting lineup thanks to Eric Hassli and Atiba Harris being out of commission. Look for Salgado to continue to make his mark on games. Right now he’s looking like a good #1 overall draft pick here. C.J. Sapong (Sporting Kansas City) – I’ll admit, I didn’t get this pick at all back in January but so far this season he’s been quite good for Sporting. He adds solid pace to the attack and has contributed on a couple goals this season. Definitely a guy to keep an eye on here. Jahil Anibaba (Chicago Fire) – The kid is good, let’s just say that right out front. While his club is struggling, he is providing a bright spot in their defense. Rich Balchan (Columbus Crew) – Oddly enough, another pick I wasn’t a fan of that is turning into a good one. Balchan isn’t going to wow anyone with stats or anything big like Bruin and Salgado will. He has become a nice addition to a Crew defense that has been solid this season. Ethan White (D.C. United) – The defense is struggling at times but White has been a nice help off the bench for this club. Perry Kitchen (D.C. United) – Same as White but for Kitchen, he’s started plenty of games this season. I think in a year’s time between him and White and a couple others for DC, their defense will be very good. Right now they’re just young, like Kitchen is.